Welcome to all Windows Users, we have come up with the new error solve tutorial for the users, who faces technical problems while using Windows 10 computers. While using Windows 10 computers and if an individual gets full blue screen BSOD error DRIVER_IRQL_NOT_LESS_OR_EQUAL, then you are at right place, as this tutorial will help you to fix DRIVER_IRQL_NOT_LESS_OR_EQUAL in Windows 10. Daily you might be facing some errors in your system while using Windows system, where some errors can’t be fixed. Therefore, in that case, you can restart your computer system or can follow some simple methods, in order to fix Windows error. Adherence to the below methods, one can solve the windows error easily. This Error comes with a reason and that, incompatible network drivers and wrong memory address. If you are facing the DRIVER IRQL NOT LESS OR EQUAL error on your Windows 7, Windows 8, or Windows 10 based PC then you can try to update all the drivers and fix this issue from your Windows PC. There are some more factors and reason behind DRIVER_IRQL_NOT_LESS_OR_EQUAL Windows 10 error and with that, you need to try so many different methods and we are going to help you to get rid out of it with all the best and useful methods to fix this error. So, let’s get started the fixing methods of DRIVER_IRQL_NOT_LESS_OR_EQUAL issue in your windows based PC. How to Fix DRIVER_IRQL_NOT_LESS_OR_EQUAL in Windows 10 Error? Here, now you can understand the best solution to fix the “DRIVER_IRQL_NOT_LESS_OR_EQUAL” and use windows without any error because it is so annoying to use the hang or full of issue-based PC because it won’t let you use the PC easily. So, let’s follow the steps and fix the error immediately without taking help of any geek friend who usually helps you to fix the errors, now it’s time to be Geek. First, the Windows user needs to press the Windows Key including R Key on Keyboard and then open RUN Command. Then, tap on the categories and tap on the link with the text called Network Adaptors. Now you need to Right Click on the Uninstall button and then uninstall the network adaptors. Then, click on the OK button to confirm the uninstallation command. Then install the latest drivers and also install the wireless network adapters, and then follow the above steps for uninstalling and install the wireless drivers. Now, you are DONE! Now check the DRIVER_IRQL_NOT_LESS_OR_EQUAL windows 10 error, and check whether it is fixed or not. If this error solved easily using the above steps and use the error-free computer but if you can’t fix this error, then try another solution that we have mentioned below. If you are not able to fix the DRIVER_IRQL_NOT_LESS_OR_EQUAL windows 10 error by using the above solution and don’t know how to perform above task easily then you can try another solution called CCleaner which you need to use in the Safe Mode. You must be aware with the CCleaner and if not, that it is one of the best windows tools for cleaning all waste or junk files and registry entries. So, here in this method, you need to try this handy tool to fix this DRIVER_IRQL_NOT_LESS_OR_EQUAL error. Once you have downloaded and install it, you need to enter in the Windows Safe Mode, and then download CCleaner Tool via above link and then run it on your Windows 10 or old windows OS based PC. After the successful installation, Start the Scan for the issue and remember that you need to rescan until no issues are found. Then restart your PC and then checked the issue solved or not. Many people are reporting one thing that, using CCleaner, you can fix almost all Windows Errors. So try this method and use this amazing tool to fix DRIVER_IRQL_NOT_LESS_OR_EQUAL error in Windows 10. You need to restart your PC first and boot into start automatic repair. Then Select Troubleshoot > Advanced Options > System Restore. Now, select the username and password. System restore window should come and then tap on Next button to proceed. Now, check Show More Restore Points Option and there are several restore points available there, and simply check the date and time for each entry and select the desired restore point. Tap on the Next. Now, follow the on-screen instructions for restarting your PC. First, you need to connect the bootable drive to your PC and boot from it. And now change your boot settings in the BIOS setting. After completing the above solution step, now wait for few minutes or more until the Automatic repair process will not finish. After repair process finished, now check whether the error is fixed or not. 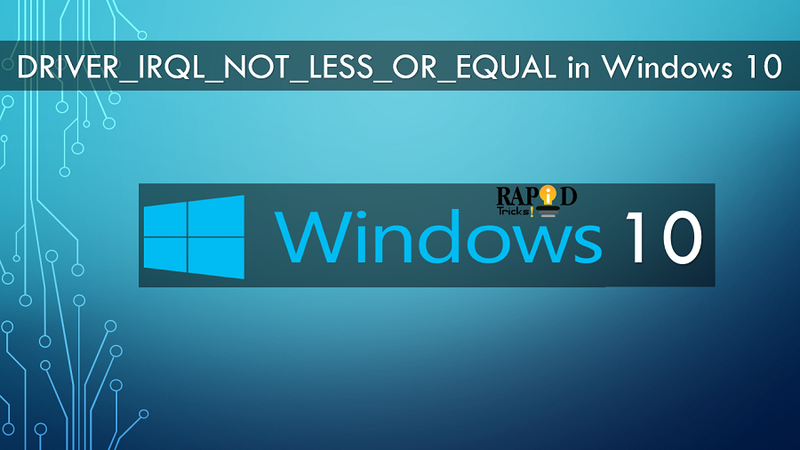 So, guys finally, we have shared all the best and tried and tested solutions or methods to fix driver irql_less_or_not_equal error in Windows 10. If you have any method then share with error facing the user and help them to fix this issue right now and they will be thankful to you forever. If you have any method to suggest here, then you can contact us and we will add that method with the name tag of yours. So now I hope you are fully satisfied with all above tried and tested methods of ours, if yes, then share it with your friends on social media handles who use Windows PCs frequently. Share your thoughts, queries, and questions in the comment section below and we will get back to you as soon as possible.